Oven Roasted Ribeye Fajita with Roasted Veggies. I took a small Ribeye out of the freezer not knowing what I would do with it other than knowing that I would pan sear and oven roast. I am still on my own for meals since Lyn is still on her special strict diet and living up to my promise to eat well. Ok Ok sort of living up to it I have days that I have reverted to a meat and potato guy but for the most part…… Anyway she made herself a Fajita and went to the bar to dig in it was then I noticed she did not use the tortillas and asked are you going to use while batting my eyes. No, it must have been two seconds until I figure out my finished meal. By this time the steak had been removed from the oven and had sat for at least 7 minutes so I slice up thin dished out some of the roasted veggie and topped with steak and a sprinkle of grated parmesan cheese. Season the steaks with salt and pepper and bring to room temperature. Preheat oven to 425 rack in center. Heat the oil over medium heat in an oven proof pan. Sear the steaks for about 3-5 minutes. Turn and place the pan in oven for about 7 minutes. Remove cover very loosely with tin foil and let set for 5 minutes before serving. 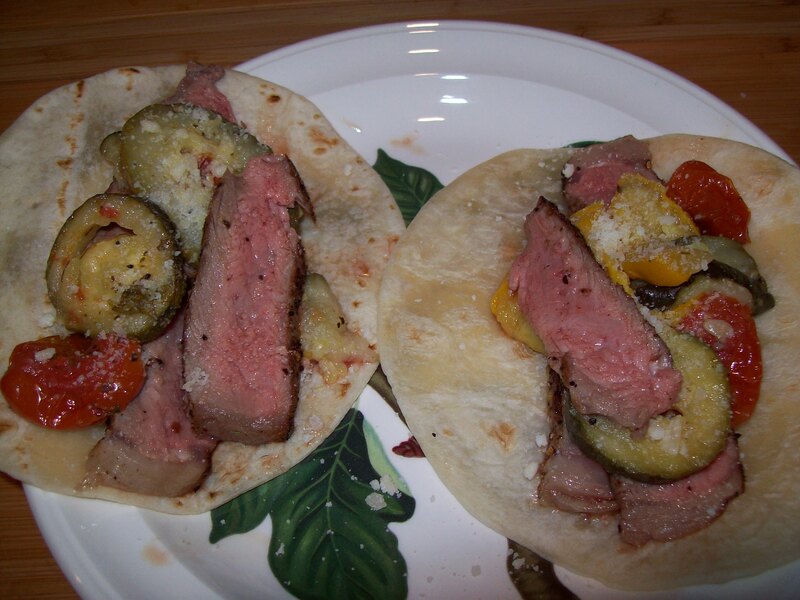 This entry was posted in Beef, Meat, Sandwiches, Vegetables and or Vegetarian and tagged Cook, Fajita, Olive oil, Oven, Roasting, steak, Summer Squash, Tortilla. Bookmark the permalink.